After three-and-a-half years of having things pretty steady with my Epi-Husky Gibson, I've just recently had a bit of a scare. 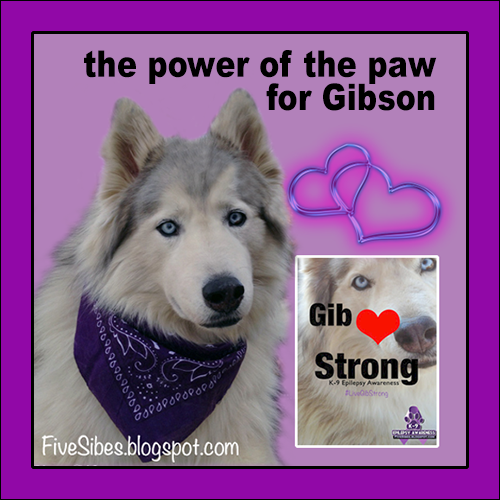 First, let me start by saying, Gibson is doing much better now. I decided to wait to post about his ordeal until after his bloodwork came back and I had a full report to post. Flashback a little more than three weeks ago. 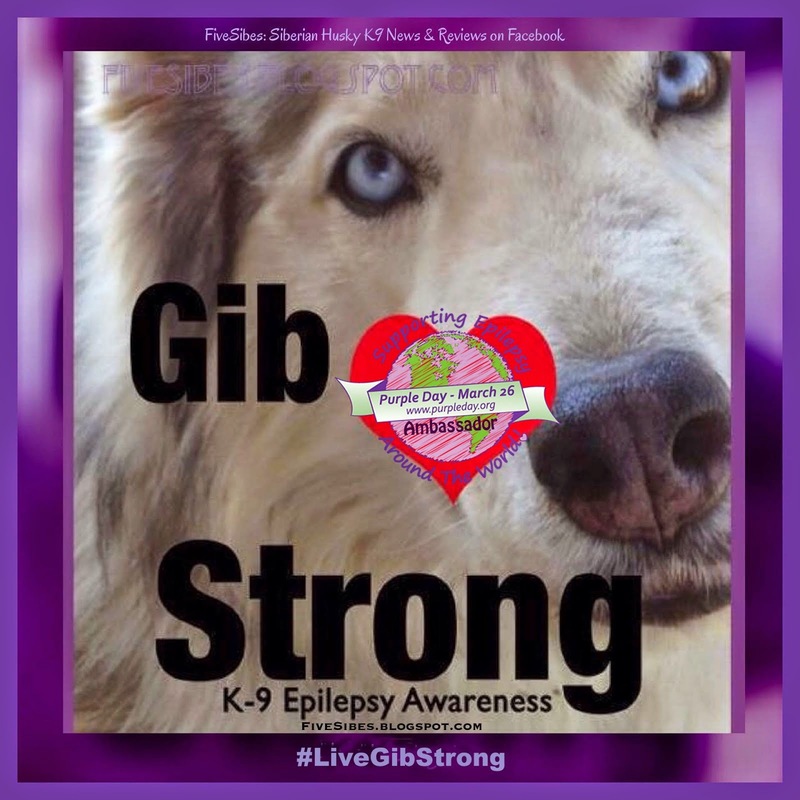 It had been time to refill Gibson’s Potassium Bromide (KBr) prescription, which is one of the meds’combination he is taking for Canine Epilepsy. 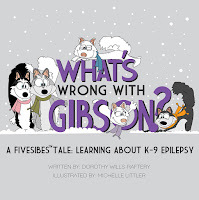 (He is also on Phenobarbital, and also Thyrotabs as his thyroid became an issue, too, which is not an uncommon link for canines with seizures). When I picked up his prescription from my vet, the 1,000 mg capsules were the same, but I noticed that the 300 mg capsules were smaller in size (as you can see from this photo, they are more than half the size of the original) and had more of a crystallized appearance as opposed to the more powder-like material in the “old” ones. It was after office hours when I discovered this, so I contacted the pharmaceutical company my vet uses and inquired. While very friendly, the gal checked with a customer service pharmacist, who had not heard of any reports of a change in the composition of the KBr capsules. Alarm bells sounded even more loudly in my head. Fortunately, I had about three capsules of the 300 mg left and held off on the “new” ones until I could get some verification that these were reformulated and not some mistake, which can happen even with humans. 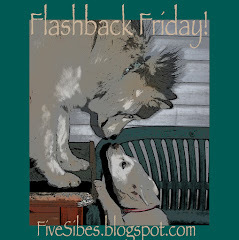 The next morning, I immediately contacted my vet’s office and they investigated it with the pharmaceutical company they used, sent back samples of both the “old” and “new” capsules, and then were advised that the company had indeed changed the compound to the formula to basically make it fit into a smaller cap, thereby making it easier to give the pet (mind you, the 1000 mg caps are way bigger and could use a little downsizing a lot more than the already-small 300 mg caps) and, to paraphrase, basically make the pet's "compliance" easier to the meds. I don't have a problem with "compliance" from Gibson when he takes his meds. They go in assisted by me, slide down, and are followed by food. Done. The 300 mgs were small enough I did not need them reformulated for "compliance" sake. I have to wonder if they were made smaller for the pet, or in order to save $$$. Now there's some food for thought. If it was for the pet's sake, why not start with the caps that were the size of horse pills? And no matter what, why was no advance notice given to the vets and the public of this change? Upon investigation, my vet received a report in writing that (I think) skirted the real questions and simply stated that they were addressing the size of the (already small) capsules.With something as serious as Canine Epilepsy, it doesn't take much to upset the delicate balance we strive so hard each and every day to achieve for our Epi-pet. A so-called simple change such as changing a compound to fit into a smaller capsule can - and in Gibson's case, most certainly did - cause a serious adverse reaction. I hate change. I really do. And things like this do not make me like it any better. You know when you get that feeling in the pit of your stomach and just know something is not right. That was this. Even with the “OK” that this was indeed KBr and not a different medication, I began administering them to Gibson, but I was leary because those capsules had still undergone a change. Almost two weeks to the date, he started his decline, and it was a rapid one. It all happened in about a period of two days. He became severely ataxic. 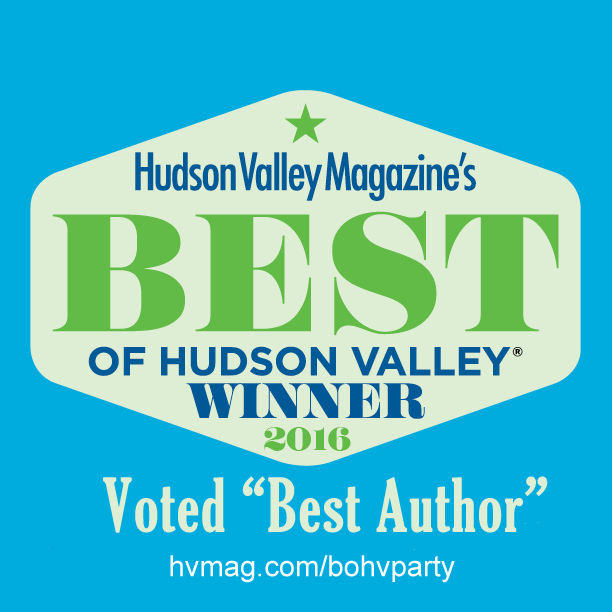 He started walking wobbly, as if he had been out partying all night. His reaction time became delayed or none at all. His hind legs gave out. Then, his front legs gave out, and he slammed his head onto the floor. His eyes were glazed. He struggled to focus on me and listen to me, but his body was definitely not in unison with his mind. I called my vet and he immediately had me bring him in and ran bloodwork. 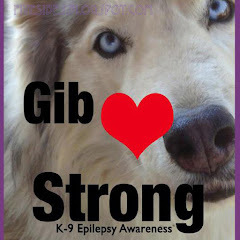 Gibson’s Bromide level – which had just come back in the perfect range in May – was now into high toxic levels. Diagnosis: Bromide Toxicity. My vet immediately dropped his dosage down from 1,300 mg daily to 600 mg (from a different pharmacy) so we could detox him. I spent that whole night on the floor next to him, hugging him, petting him, talking to him to let him know everything was going to be alright. So what changed inside of a month-and-a-half? His diet was exactly the same (and I am very specific about what I feed him). 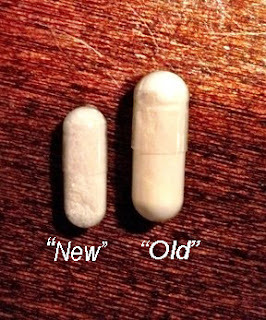 The only thing different - was the changed compound in the new smaller capsule. Gib as he started to feel better. 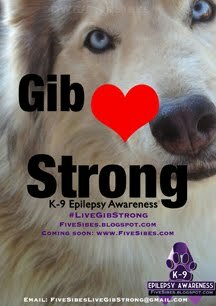 Gibson stayed on the lower 600 mg dosage of KBr for three weeks, and each day, I saw a little more of my boy’s spark come back. First, he regained use of his legs. Then his response time became better, his eyes clearer, and the last to work itself out was his wobbly drunk-like walk, which took some time. 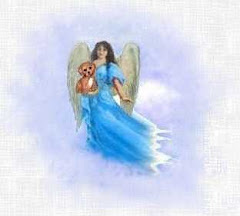 He started becoming alert, very responsive, less lethargic, and has even began some running and playing with the others. 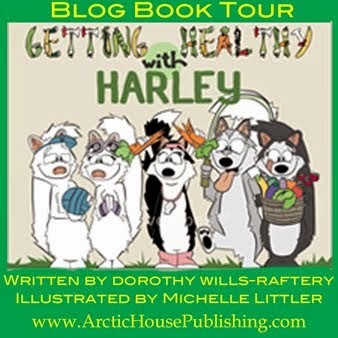 He even took Harley by surprise by engaging in some Husky play with her when she pounced him, expecting him to just lay there and he bounced up, chased her, and played back like he was a two-year-old again! He just had his three-week follow-up blood test, and his levels have once again hit the “perfect” range. And the decision has been made to keep him on the lower 600 mg daily dose now, with a follow-up blood test again in about five weeks to see if he is maintaining the levels under the new dose, or if it needs to be changed. 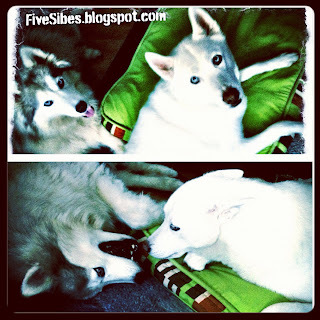 I’m hoping for a stay so he can enjoy being a Husky again without being so lethargic. 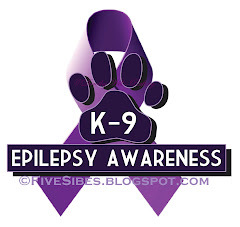 But, that said, I will adjust and do whatever I need to in order to give him a happy, healthy life with meds for his Canine Epilepsy. While I am relieved that the frightening episode is over, I have to remain cautious. The thing about KBr is that is stays in the system at therapeutic levels for almost a month. So while detoxing him, I had to keep a very cautious eye and pray he didn’t have backlash seizures as they work their way out of his system. And now, even more so as we stay at the new lower dose. So there is always that fear. 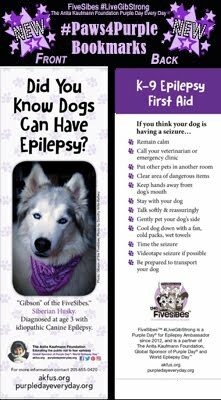 But as any Epi-dog parent can tell you, with Canine Epilepsy nothing is a definite. Even on meds, it’s no guarantee that a dog won’t seize again. And, as we are proof, even the meds can’t always be trusted to work like they should. I’d like to say I was surprised by the Bromide toxicity, but I wasn’t. Those stinking pills raised all kinds of caution flags to me right from the get-go. While the pills were not a mistake, the recompounding could have made the caps slightly different, possibly a formula that is maybe stronger or gets into the system faster, whatever it is, it was enough to throw his entire system balance way off. And I caught it at the very beginning stages. The key lesson here is, if something doesn’t look right, check it out. If all reports come back OK, and you begin to administer the meds, just keep a really close on eye on your furkid. And not just for a day or two, as with KBr, it sometimes takes several weeks for it to accumulate (or in our case detox) in the system, so you may not notice a change right away. Gibson hanging out & talking with little sis, Chloe. That all being said, I am hopeful. They say out of every bad comes good, and that’s how I choose to look at this. I am trying to let go of the anger and asking “Why in the world did the company change formulas for just the 300 mg?” and “Why didn’t they let the vet and public know?” and “Why didn’t their own customer service pharmacist on call know?” Now that Gibson is doing better, I am working on looking at the positive. 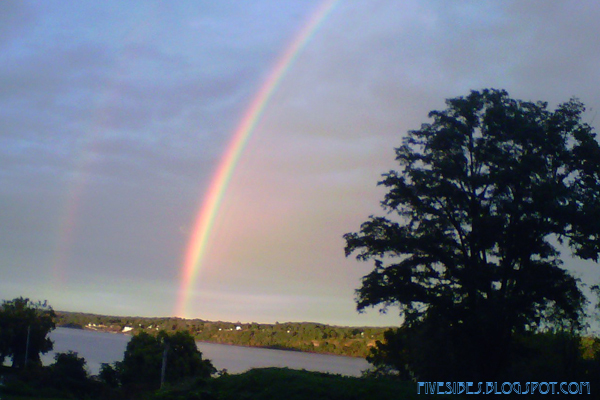 If he didn’t have this experience, we may never have looked to reducing his meds since he was holding steady. The key is to keep the seizures at bay, and we were, and since his chem panels were all coming back good, there would have been no need to look at a reduction. While he is definitely doing better from the Bromide toxicity, he has had a vomiting episode, so I’ll keep a close eye on that also as so many things can contribute to that. He had that pretty often in the past, but when I changed around his meds and vitamins, we seemed to work that out. This could be tummy upset from the meds. It could have been due to the heat. Our power had gone out, so there was no A/C or fans for about two hours, so out in the s shade was actually cooler than inside. But, that could have been enough to upset his GI system. Yesterday, he was back to normal. So it’s all a work in progress while under my ever vigilant watchful eye. We are in for some severe weather, so we are battening down the hatches. The Sibe kids are all inside safe and snug waiting out the storm as the skies have grown dark and gray and the thunder has stated. 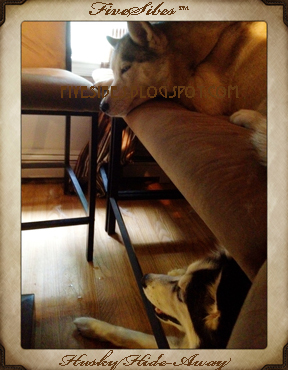 Pictured here, Bandit and Harley have found their Husky hide-away to wait out the storm in! Let's all be safe whoever is in the red belt of storms crossing the country. And don't forget to include your pets in your emergency storm planning. It's Another Hot One...Pool Party!!! 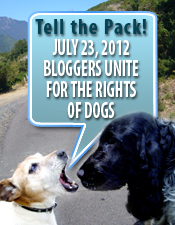 Today is a very important day in the Blogisphere...it's Bloggers Unite for the Rights of Dogs day. 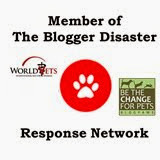 The Be the Change for Animals (BtC4A) has proudly partnered with Blog Catalog and Dog Rescue Success...and all of us..."to harness a global online community to help save the lives of dogs in need." 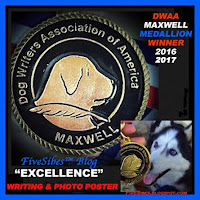 Since this is such an important issue, today's post is a tad on the long side, but filled with lots of info, available Huskies from rescues, and even a prize pack giveaway! So kick back, put your feet up, gather your pets around and please read this longer than usual post. You'll be glad you did! 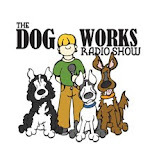 So what does all this Uniting for the Rights of Dogs mean? 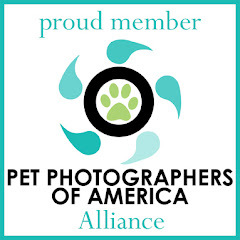 It means that while one voice for the rights of dogs is commendable, many voices joining together is what it will take to make change and benefit dogs and future generations of dogs by uniting now against puppy mills and pledging "No Pet Store Puppies." My family has adopted shelter and rescue animals for years. 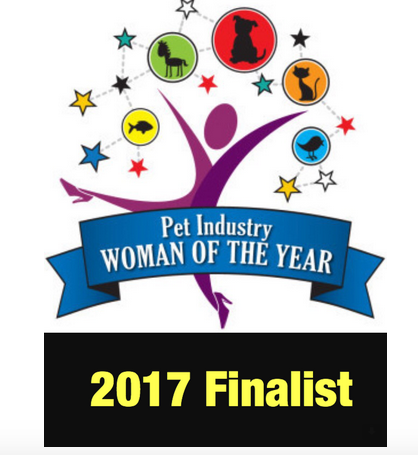 We've saved pets from accidents, raised babies who were motherless, and also have had some pets from reputable breeders. What we all need to do is to join together to support the many shelters and rescues who are out there every day saving animals. 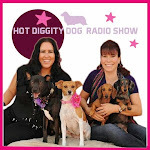 There are so many ways to support them, whether it is spreading the word about their work, donating money or supplies, helping with transporting, visiting shelter animals, fostering, and adopting rescued dogs. The ASPCA estimates that there are thousands of pet stores in the U.S. that sell puppies. The ASPCA ultimately seeks to convince pet stores to limit their business to pet supplies and encourages them to partner with their local shelters to offer adoptable pets in their stores. Operators of puppy mills breed dogs in unsanitary, overcrowded and often cruel conditions where profit is given priority over the well-being of the dogs. According to a poll conducted by Lake Research Partners and commissioned by the ASPCA, 78 percent of consumers are unaware that most puppies sold in pet stores come from large-scale commercial breeding operations commonly known as puppy mills. The poll also reveals that nearly 80 percent of consumers would not purchase a puppy if they knew it came from a puppy mill." 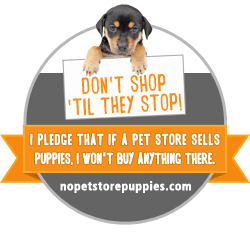 Have you taken the ASPCA's No Pet Store Puppies pledge? Simply put, you pledge that if your local pet shop sells puppies, you will not purchase anything there. 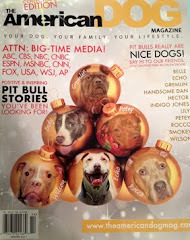 Instead, check for pet supply stores who offer adoptions. Not sure of stores in your area that do...or, do you know of one that does? Then check out this Map of Stores Offering Puppy Adoptions. Pets in rescues or shelters are not second-hand pets. They are not "damaged" dogs. They are dogs in need of love and a forever home. They all started out somewhere...the shelter and rescues are where they wound up because someone somewhere abandoned them. I think the rescue folks are amazing people. 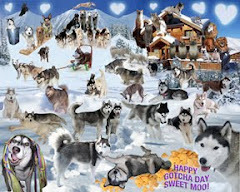 The number of Huskies I see rescued each and every day by caring folks across the globe is just outstanding. Healthy, sick, injured, abandoned, abused. They try to help them all. But it's still not enough. The amount of homeless and abandoned Siberian Huskies is epidemic. And that is just one breed! We need to start to stop this epidemic of homeless animals somewhere, and that's what this day and campaign is all about. I want to take this opportunity to highlight some beautiful Siberian Huskies just waiting for someone to love and to have someone to give their love to. These beauties are from various shelters and rescues across the country, some are puppies, some are young adults, some are seniors, and some have special needs. They all deserve love and care. 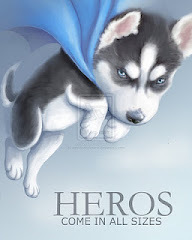 Please take some time to click on the following links and see if there is a Husky you, a family member, or friend can give a home to or even foster. Beautiful "Snowflake" is a 2-year-old boy available for adoption through the ULSTER COUNTY SPCA in Kingston, New York. 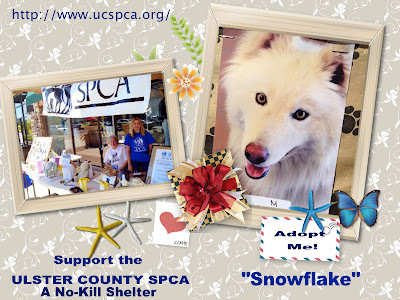 NOTE: I am happy to report that of posting time, Snowflake has been adopted! Woo! Stop by the UCSPCA site to check out other beautiful potential adoptees! Handsome "Sampson" or "Sammy" as his foster family calls him, is just a pup at just under a year old. He is available for adoption through the SIBERIAN HUSKY RESCUE OF FLORIDA in Seminole, Florida. 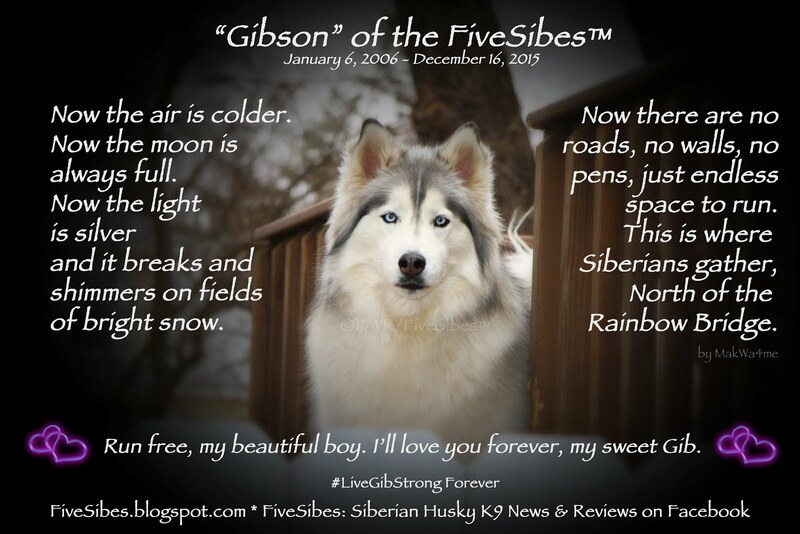 They also feature a FREE national registry for listing Lost & Found Siberian Huskies. Beautiful "Sitka" is just a year old and looking for his loving forever family! He is available for adoption through FREE SPIRIT SIBERIAN RESCUE in Harvard, Illinois. Pretty "Emmy" is a tripawd three-year-old who is a happy Husky and doesn't let three legs stop her from doing all things Husky! She would love a forever family to love and play with. She is available through TAILS OF THE TUNDRA SIBERIAN HUSKY RESCUE in Colmar, Pennsylvania. Striking "Jazz" is so excited to be thinking about his forever home! He is three years old and is available for adoption through TAYSIA BLUE SIBERIAN HUSKY RESCUE in Omaha, Nebraska. Don't forget to say "woo" to Tay while visiting their site! Beautiful double parti-eyed girl "Luna"would love to come with a forever family! She is available for adoption through MAPAW SIBERIAN HUSKY RESCUE in Boyertown, Pennsylvania. Pretty girl "Isolde" is all smiles just thinking about a forever home! 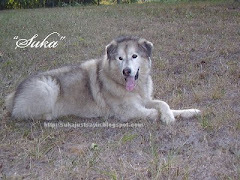 She is eight-years-old and waiting at the ALABAMA SIBERIAN HUSKY RESCUE in Clay, Alabama. Handsome 7-month old puppy "Jeremiah" is excited about being adopted into a forever loving home! 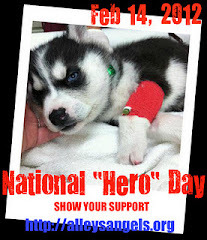 He is available for adoption through ALLEY'S RESCUED SIBERIAN HUSKY ANGELS in Corona, California. Beautiful special needs (thyroid condition) "Misha" is a pretty wooly Siberian Husky who is five years old and dreaming of a loving forever home. 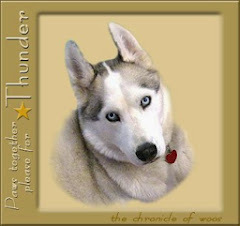 She is available through TUNDRA SPIRITS SIBERIAN HUSKY RESCUE in Galway, New York. Handsome "Nugget" is a wooly boy who is all smiles looking to be adopted by his forever family. He is currently with ADOPT A HUSKY in Carol Stream, Illinois, who serve the Northwest and Pacific Northwest regions of the United States. 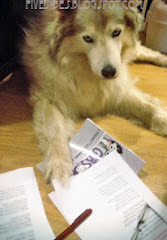 Check out handsome "Rogue" from HUSKY HAVEN OF FLORIDA in Clearwater, Florida. He is looking for his forever home! 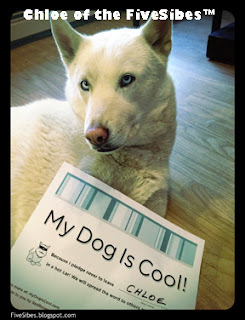 To adopt him, please contact Husky Haven! "Lova" is a beautiful red & white Siberian Husky 1-2 year old female. 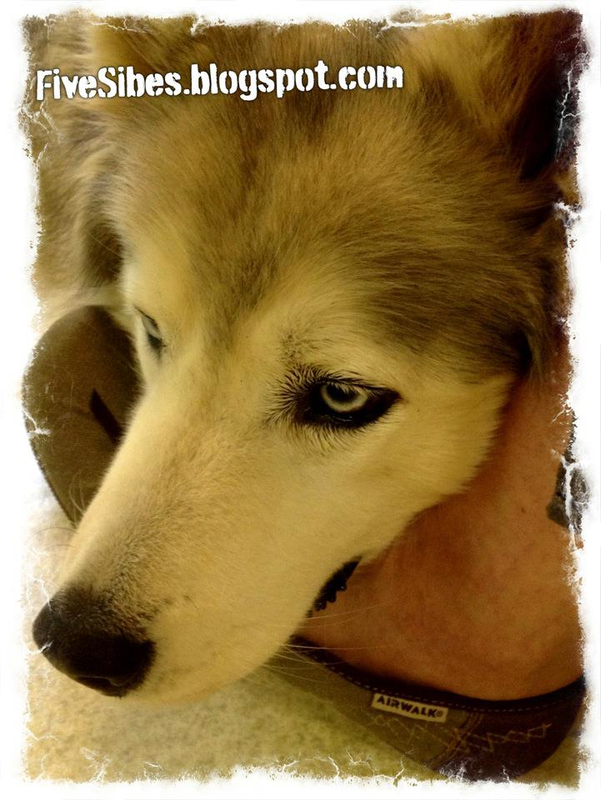 She is available for adoption through HUSKY HOUSE in Mattawan, New Jersey. 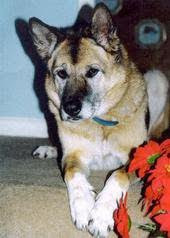 Handsome "Gannon" is looking for his forever loving home. 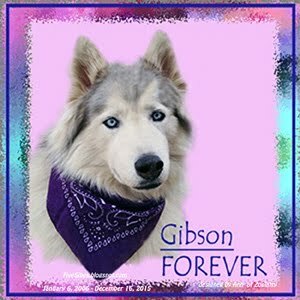 You can get adoption information on this boy from TEXAS HUSKY RESCUE in Carrollton, Texas. Beautiful "WaChee" is a 5-month-old pup who would love to grow up in a loving forever home. He is currently residing at NORTH STAR SIBERIAN HUSKY RESCUE in Denver, Colorado and waiting for someone to come adopt him! Meet "Bosco" a stunning "Malberian" boy from HUSKY CAMP in Wrightwood, California who is just waiting to be adopted into a loving family. Handsome "Phantom" is a young Siberian Husky male available for adoption through PATRIOT SIBERIAN HUSKY RESCUE OF NEW ENGLAND. 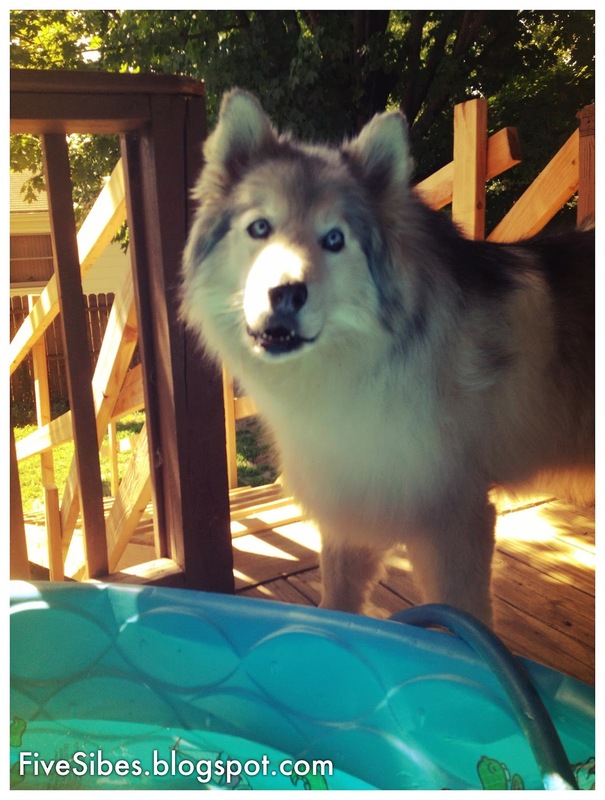 "Shadow" is a handsome 2-year-old Alaskan Malamute and Siberian Husky mix. He is currently with a foster family and is looking for his forever home. For adoption information, visit MUSH SIBERIAN HUSKY RESCUE OF ATLANTA from Georgia. Pretty "Nali" is a three-and-a-half year old just looking for her forever home! 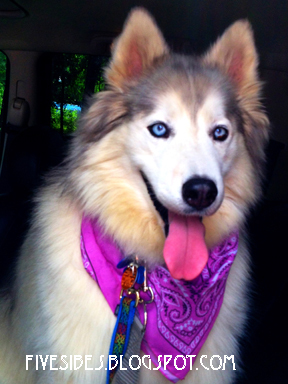 She is currently available for adoption through BLUE RIDGE HUSKY RESCUE in Asheville, North Carolina. Meet "Rascal" a cutie who is available for adoption through the HUSKY PACK RESCUE in Powder Springs, Georgia! "Wolf" (Niko) is a handsome Husky mix who is just smiling thinking about his forever home. He is available from the SOUTH FLORIDA SIBERIAN HUSKY RESCUE in Lauderhill, Florida. Adorable "Bobtail" is all smiles! This 7-year-old boy is available for adoption through the SOUTHERN SIBERIAN RESCUE in Raleigh, North Carolina. "Blinky" is a beautiful Siberian Husky waiting for his forever home at HUSKY HAVEN OF LOS ANGELES in Palmdale, California. Handsome "Captain Jack Sparrow" is bi-eyed 2-year-old Husky who has use of one eye due to a healed old eye wound. He would love to be adopted in a forever home! For more info, contact the HUSKY HAVEN, INC. in Houston, Texas. Pretty "Bella" is a one-and-a-half year old bi-eyed female Husky who was turned in after her family lost their home to a fire. She would love to be adopted by a forever loving family! You can obtain adoption information from CRESTON PET ADOPTION & WELFARE SOCIETY in Creston, British Columbia. 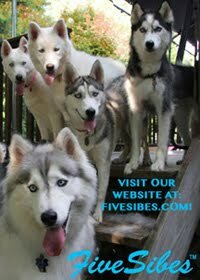 These are just one Husky each from a just a few Siberian Husky rescues that are out there working to save these beautiful dogs. 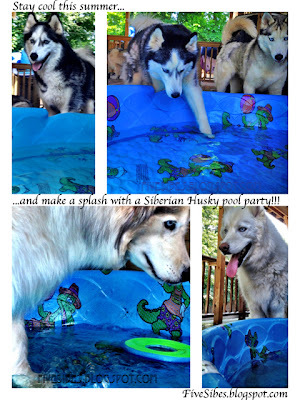 For a listing of Husky rescues in your area, visit RESCUE SHELTER'S LIST OF NATIONAL/INTERNATIONAL SIBERIAN HUSKY RESCUE GROUPS. 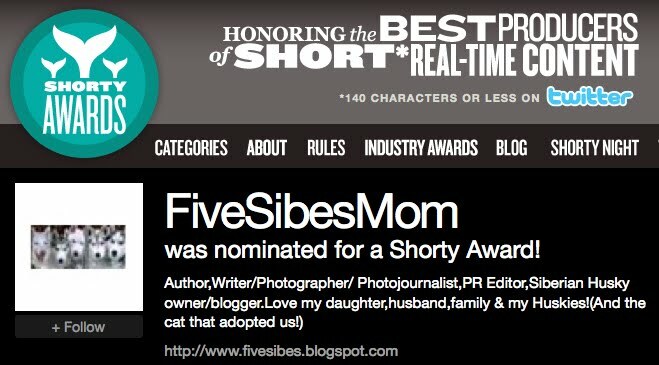 Also check out Sibes from across the country at RESCUEME.ORG, and through PETFINDER.COM. And please, please consider visiting one of these rescues and even fostering one of their beautiful homeless Huskies to see if this breed is right for you before adopting. 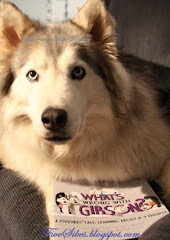 Together, we can help future homeless Huskies and dogs by spreading the word about puppy mills and promoting adoptions from shelters and rescues. 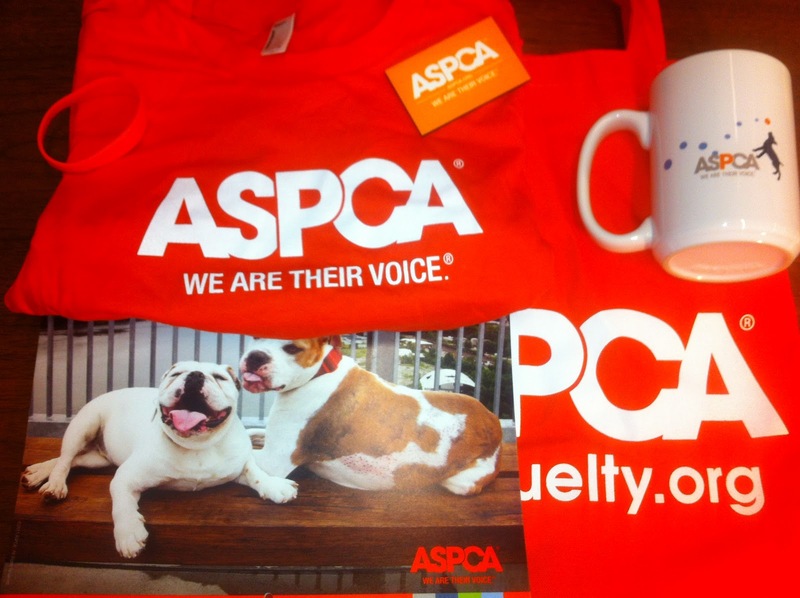 Thanks to the ASPCA, we are sponsoring a Gift Basket as part of this campaign to one lucky prize winner who takes the "No Pet Store Puppies" Pledge! If you live in the United States, you can complete this Rafflecopter for a chance to win it! Just take the pledge and then leave us a comment here. Winner will be announced at the end of the week. Together, we CAN Be the Change for Animals. I want to leave you with one of my favorite quotes by Immanual Kent: "We can judge the heart of a man by his treatment of animals." Congrats to EMILY T. for winning the ASPCA's gift pack! Wolf watching Binx...or is it Binx watching Wolf? 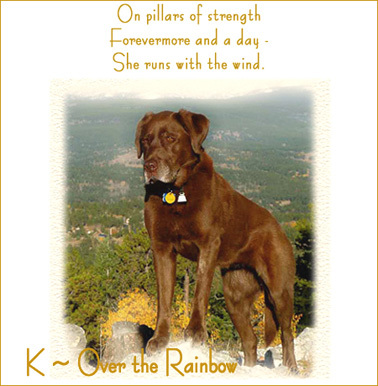 We here at the FiveSibes were so saddened to learn that K of Romping and Rolling in the Rockies has lost her battle with cancer, so today's blog is in her honor. If there ever was a soul we truly believed would overcome, it was beautiful K. To look at her gorgeous photos and see her so full of beauty and spirit and read about all of her adventures with R and Hu-mom KB, it just seemed so impossible to think she would one day not be here. 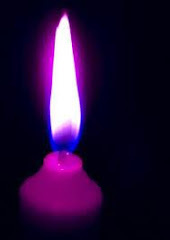 We send our heartfelt condolences to K's family and our Huskies are sending soft woos toward Heaven where K is now happily climbing those beautiful mountains beyond the Rainbow Bridge. Run with wind, indeed, beautiful girl. 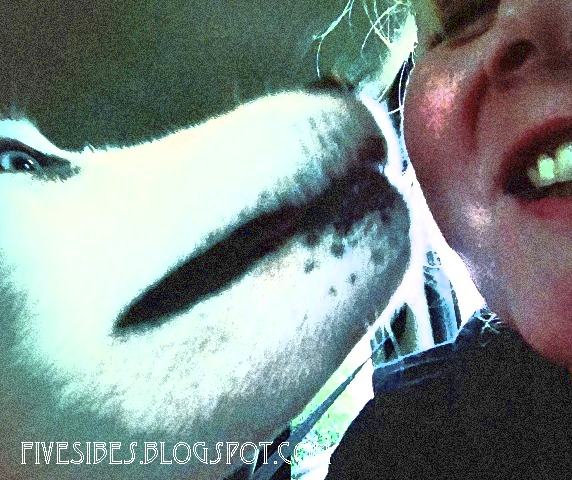 Tonight, there will be lots of extra hugs and kisses with our furkids. As KB says, seize the day for we do not know what tomorrow holds. 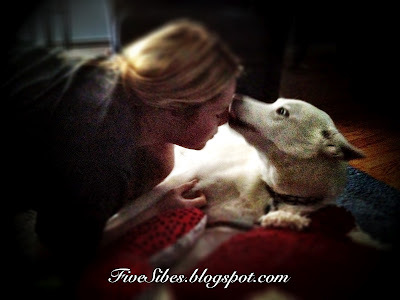 Be grateful for the gift of love we receive each and every moment from our family - both two- and four-legged members. all about you will be beauty. My dogs are cool…are yours? 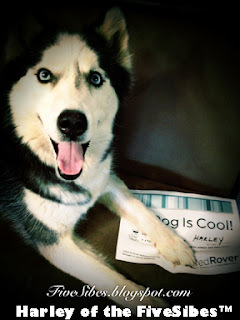 Harley is one cool Husky. 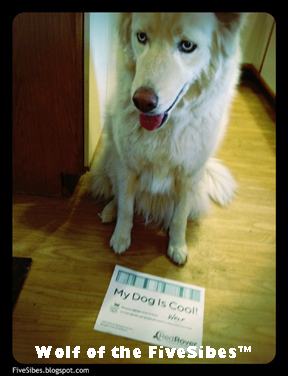 Okay, so we’re bragging a little…our dogs ARE cool…but I will get to why in just a moment. First, before we start talking about why our dogs cool, let's talk about what the significance of today is. 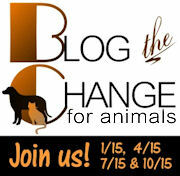 Today is "Blog the Change for Animals," which is part of "Be the Change for Animals (BtC4A)," and we are joining other pet lovers and advocates across the globe to Blog the Change about a cause that is important to us. 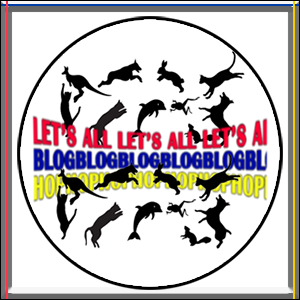 According to BtC4A, Blog the Change is when we, the pet community, "Come together to support people helping animals in need each 15th of January, April, July and October. 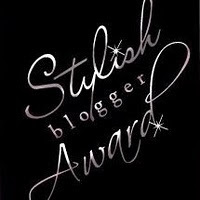 Bloggers, write about a cause near and dear to your heart." 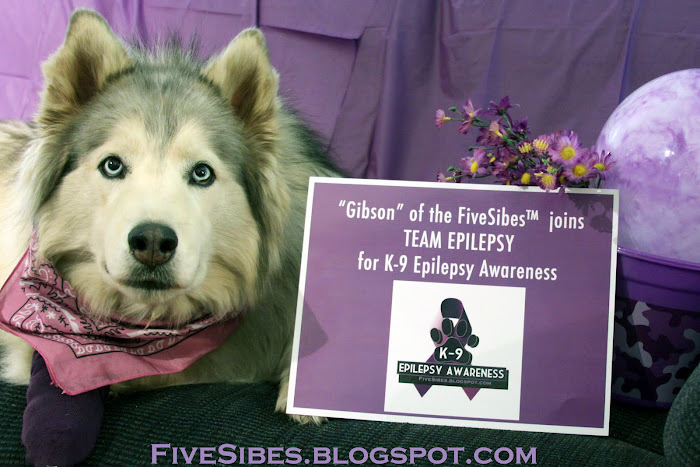 Previously, I have blogged about Canine Epilepsy Awareness, which is very near and dear to my heart, and Helping Huskies in Need. 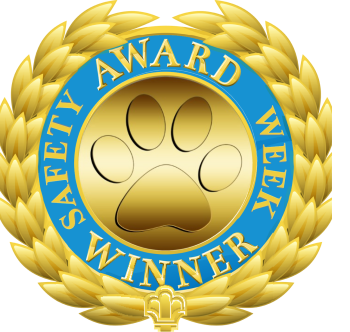 I've also participated in Blog the Change for Animals about Pet Fire Safety and Pet Oxygen Masks, Prevention of Animal Cruelty, Be Smart Ride Safe® Bark Buckle-Up for Animal Safety & Protection, and Pledging for Safe Pet Travel. "When it was 72 degrees outside, a car’s internal temperature climbed to 116 degrees within one hour." 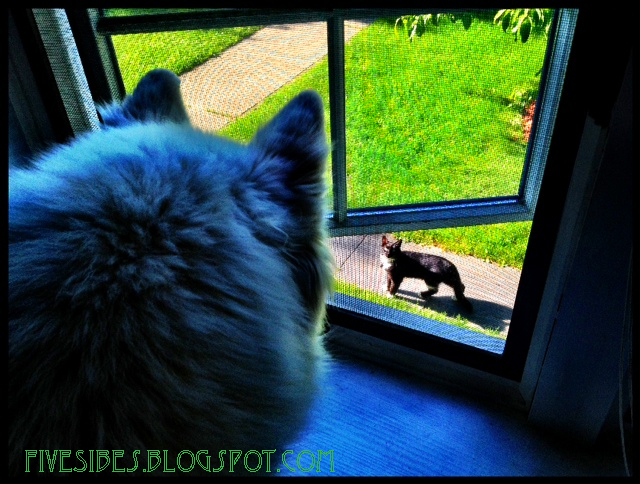 This installment, I'd like to talk about keeping our pets safe during the hot weather months. 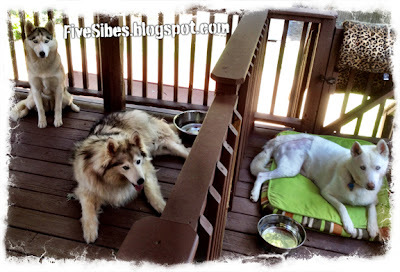 So, back to bragging rights and why our Siberian Huskies are so cool. They are cool because during the hot weather we make sure they always have fresh cool drinking water all day long, a pool filled with refreshing water they can splash in and out of when they are outdoors, and plenty of time indoors snoozing in the air conditioning with fans rotating overhead.When going for walks, we do so in early morning and after sundown, and they are walked along the grassy road's edge and not on the blacktop. I try to stick to shady paths, and always have a water bottle and portable dish with me to give them a rest and a cool drink. 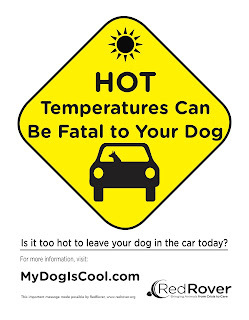 If I need to go to vet's during the hot summer months here, I cool my vehicle off first with the air conditioner and then drive them over (secured with a safety belt). 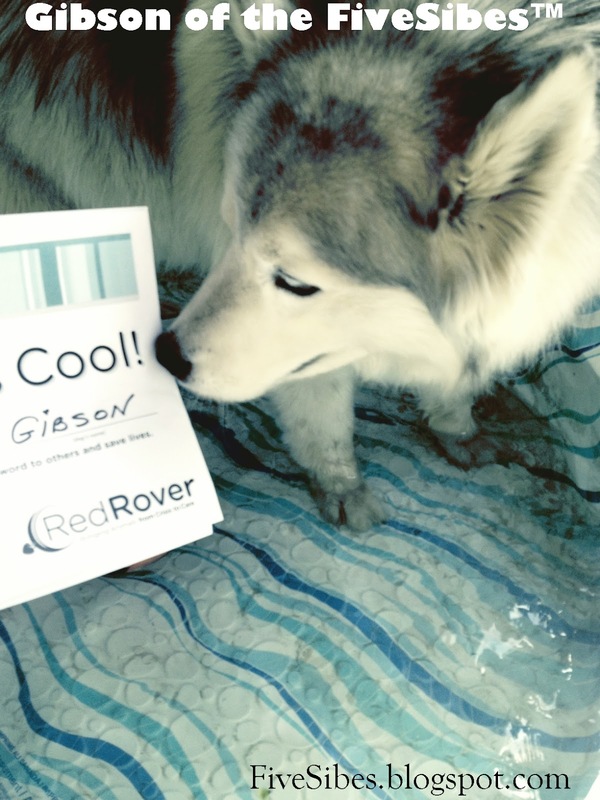 Gibson took the Cool Dog Pledge! We also never, ever, ever (did I mention ever?) leave our dogs in the car…not even for a minute to run in a store. 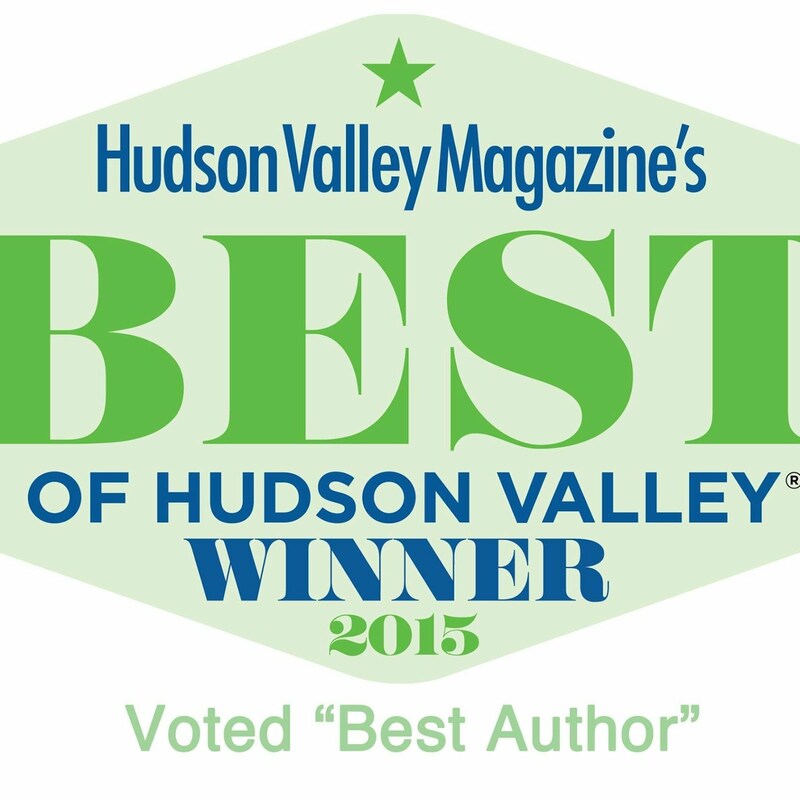 I never did it with my daughter, and I do not do it with my furkids. Did you know that on a comfy and seemingly cool 72ºF day, the temperature inside of a car can reach 116ºF? That’s brutally hot for me, now just imagine what kind of harm it can do to a dog. Especially vulnerable to heat-related illness because they can only cool off by panting and through the pads in their feet. Even seemingly mild days are dangerous. In a Stanford University study, when it was 72 degrees outside, a car’s internal temperature climbed to 116 degrees within one hour. Enclosed cars heat up quickly. In a study by San Francisco State University, when it was 80 degrees outside, the temperature inside a car rose to 99 degrees in 10 minutes and 109 degrees in 20 minutes. 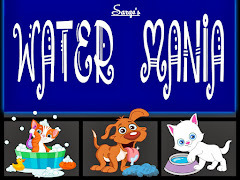 A dog’s normal body temperature is between 101 to 102.5 degrees; a dog can only withstand a high body temperature for a short time before suffering nerve damage, heart problems, liver damage, brain damage or even death. Studies show that cracking the windows has little effect on a vehicle’s internal temperature. 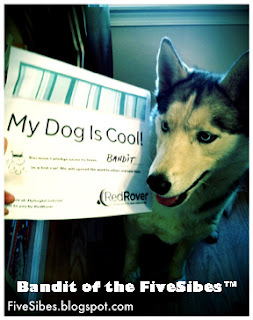 Bandit loves to be a cool dog! And…it IS illegal in 14 states (needs to be in all 50). You can check out the areas where it is illegal to leave animals in parked cars, also known as "inhumane confinement" by visiting the Animal Legal & Historical Center website. 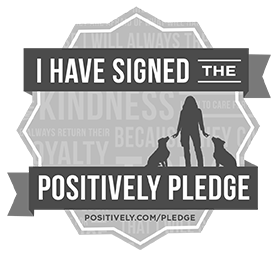 I invite everyone to come join in and pledge to help pets from becoming seriously ill and dying a horrible death because their owner - the person who is supposed to love and care for them - just could not leave them at home where it is safe and cool. Help me educate folks by visiting the MyDogIsCool.com website and taking the "Is Your Dog Cool? Pledge" and downloading some of their flyers and posters to share with everyone everywhere. Wolf wants You to be Cool! Together, we just may save an innocent dog somewhere from frying in a car. 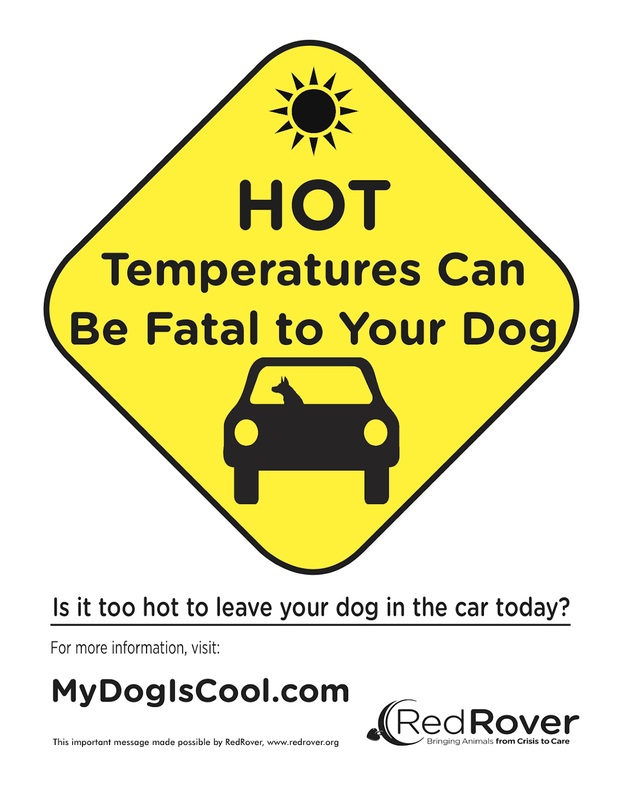 Together, we can make a difference by helping to educate people about the dangers of leaving their dogs in a parked car, even with the windows cracked. 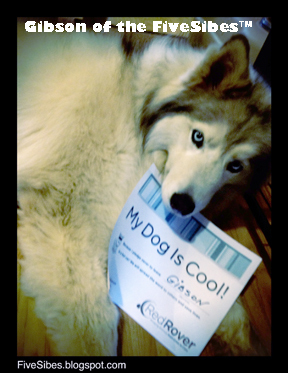 So join me in having the coolest dogs around...and let's get even more dogs to join our Cool Club by Being the Change for Animals! 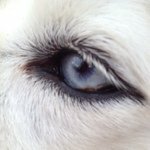 I'd also like to take a moment to help spread the word about the "Bloggers Unite for Dog Rescue" online event on July 23rd to promote dog adoption. 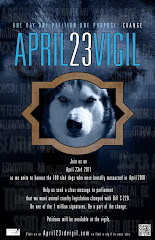 Visit Be the Change for Animals Link for more details on how you can join in. In the meantime, enjoy the warmer weather, stay safe, watch out for pets in hot cars (get help if you see one), and be cool! An Update on Chloe and a Family Thank You!